Please exchange this voucher for tickets at the Buckingham Palace Ticket Office (Buckingham Palace Road, London SW1A 1AA, UK), where some queuing time should be expected. The Ticket Office is located next to the Ticket Holders’ Entrance on Buckingham Palace Road. Latecomers will not be admitted. The iconic and beautiful royal residence of Buckingham Palace serves as both the office and London home of Her Majesty the Queen, as well as the administrative headquarters of the Royal Household. It is one of the only working royal palaces remaining in the world today and the Buckingham Palace trip is an absolute must-do on any visit to London. The 19 Buckingham Palace State Rooms form the heart of the working palace and are lavishly furnished with some of the greatest treasures from the Royal Collection - paintings by Rembrandt, Rubens and Canaletto; sculpture by Canova; exquisite examples of Sèvres porcelain; and some of the finest English and French furniture making this tour of Buckingham Palace a memorable one. 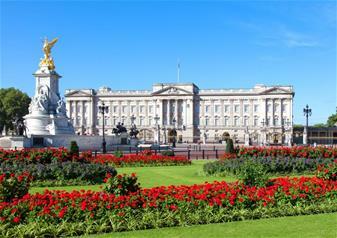 Buckingham Palace is the biggest working palace in the world and the epicentre of the British monarchy. With over 800 staff and 775 rooms, the Palace and all who work in it support Her Majesty the Queen and her family in their day-to-day duties and activities. You'll get to see the rooms where the Royal family carry out official ceremonies and entertaining. Multimedia guides are included in the admission price and are available in the following languages: English, French, German, Spanish, Italian, Japanese, Chinese, Russian and Brazilian Portuguese. Described as a 'walled oasis in the middle of London', Buckingham Palace garden is home to thirty different species of bird and more than 350 different wild flowers, some extremely rare. Visitors end their Buckingham Palace tour with a walk along the south side of the garden, with splendid views of the west front of the Palace and the famous lake. Being one of the few working royal palaces in the world, Buckingham Palace is open every year in the summer for a limited time only. No wonder it is on the highly recommended list of many that visit London. This year it will be open as below: Monday 22nd July 2019 until Sunday 29th September 2019 with varied time slots between 10.45am and 6pm. You must also see the changing of the Guard ceremony at Buckingham Palace- a must when visiting London!